cute thanks.. I was wondering what else I could do with 150 feet of freezer paper that is in my pantry. So pretty, love it as always!! Wow, I would have never guessed that it was muslin!!! I have a huge bolt of muslin upstairs. Hmmm. Thanks for the inspiration! I voted for this one as my favorite on sytyc! I thought you used white paint on colored fabric - this is even cooler! I even have everything to do this.... great something else to add to my list of projects. I still need to make my ruffle and gathered pillows! This week's voting was harder than last week's. So many cool projects! Awesome. I have never used freezer paper. A whole new world is opening up. Now I have something else to add to my must do list. ewwwww the possibilities are endless! Thanks for sharing. Thanks for the tute, super cute!! wow! I love spraypaint and pillows and freezer paper. thanks for the tutorial. I have already linked it for everyone I love to see! Beautiful!!!! It sounds easy enough too. This was my favorite of all the projects last week (even mine!). Your sense of color is great. I think these would work well as outdoor pillows, since the spray paint might create a bit of a moisture barrier. Though of course they'd be best under a porch rather than out in the yard. they are definitely on the stiffer side. it kind of feels like outside furniture fabric after i was done. and yes! i think i'm going to do that for my front porch next year!!! I love this idea! Stiff and scratchy would be okay for a seasonal, decorative idea!? I'm going to have to try this! Thanks for the tutorial! Vanessa, that is so cute and so doable! Thanks!! Love these! So funny...I completely thought you had brown and green fabric and painted white on them! that was not was i thought you were going to do! very innovative. thanks for the sharing it with us. So creative! I would have never guessed this is how you would do them. 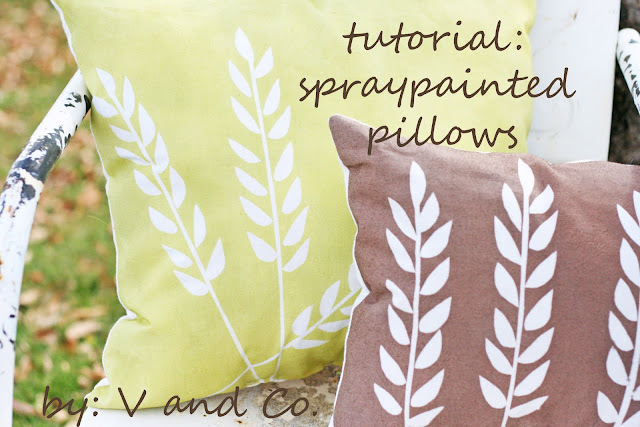 Did you know there is fabric spray paint? I've seen it....I think it was at Hobby Lobby in Ohio, but I didn't look at it too close. Maybe then if you dry it your dryer won't start on fire and explode. Even though that would be exciting. Love Love Love these pillows! So I think you're pretty crafty! What an easy project, I never would have thought. Thanks for sharing! Good luck with the rest of the competition!!! Very clever. I think I might try another blast of spray paint after taking the iron on template off for a monochromatic look. Clever! I also thought you had painted the white part. I totally voted for these and was wondering who made them!! So classy & fun! why, oh why, do I have so much work to do this weekend? I want to make a bunch of these instead!! hi found you via one pretty thing - i love your idea - can you tell me more about the spray paint? i've never seen any for fabric specifically in the uk! Awesome! thanks for teaching me (and everyone else)! They're so gorgeous! I voted for them on SYTYC. Thanks for the tutorial! ahh i am so glad i came across your site... i totally voted for you. these pillows are SOO cute! and i have been dying to do some stenciling. i bought freezer paper forever ago and have yet to put it to use. this is so cute though. thanks for sharing!! Love this idea. I've used freezer paper on projects before but I always use the paint on the inside of the design. I love the reverse technique. I'll have to try it out! i think you are going to take the cake at the craft challenge this week! i just love the no sew wreath and i can't wait to make one! This is a must! Love it! 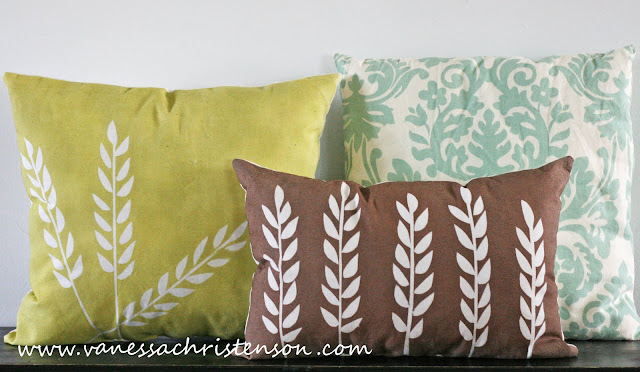 I have to be the only person around who can't find freezer paper, but I so want to do these pillows. Is there something else I can use in it's place? You always have the most creative ideas! I may mention this on my 'Mom-friendly' podcast (and give you credit of course). I have never even heard of freezer paper! Super cute! That wheat pillow would make a great gift for my favorite bread baker! I had no idea... freezer paper? Iron on? BRILLIANT! Thank you, that made my day...and my list of new things to make for the holidays. i LOVE these! how did they not win?? thanks for the tut! i spray paint a lot of things and do lots of freezer paper stencils but would never have thought to use them together. I love the pillows! You should be proud of yourself!!! How clever to make stencils! You are a crafty mama! Super cool! When you said earlier in the week tutorial was coming I thought it was applique and said nope.... but spray paint I can handle! You have been featured today--be sure to go see the post and Grab your I've been Featured button. Also I am your newest follower--I already thought I was a follower--You are one of those blogs I check regularly, so how uncool is that --not being a follower--well I am COOL now because I am a follower. It looks like you just used ordinary spray paint. Didn't it make the fabric stiff? Those pillows match my blankets and my mattress. They are just perfect. Thanks for the inspiration. Wonderful idea! Is that damask pillow seriously stenciled and spay painted??!!?? Wow... it is gorgeous!! I LOVE this idea!! So creative!! Thank you for sharing it with us!! How did you do the Damask looking one? Do you have the stencil to download like you did the wheat? Just wondering...thanks so much! Could you use this technique on any other medium, such as canvas? I never knew freezer paper would adhere with an iron, at least enough to hold still for painting... Thanks! I just saw some pillows almost exactly like that at Macy's for 30 BUCKS EACH!! Thank you for your DIY prowess, I'm gonna make em and save some dough! These are lovely! They turned out great and I'm pinning to do in the near future. Thanks for the tutorial, I saw you featured at Addicted 2 Decorating. Wow, this is such a brilliant idea. I love being creatively crafty as well, and at times incorporate my ideas with my inspiration sources. Keep on inspiring others! Wow! So beautiful! I love it. Thank you very much for sharing this wonderful design :) You're an artist!